In one sense, Lisa and I have been taking a two week vacation in two phases, interrupted by a Worldcon in the middle of it. Today was the last day of the first phase of that vacation. As with the other posts in this series, there are many more photos on Flickr than what I'm posting here: click through to see the others. 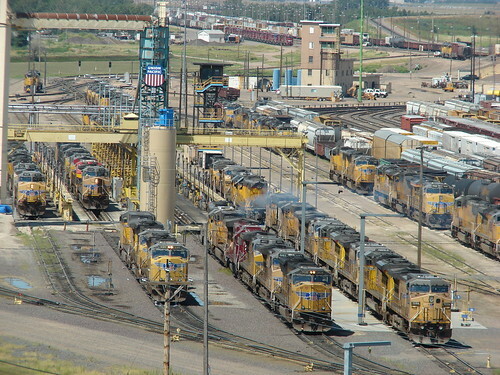 We started in North Platte, where after loading out from the hotel, our first stop (after a brief visit to a convenient Walgreen's to pick up some necessary supplies) was the Golden Spike Observation Tower at Union Pacific's Bailey Yard, the largest railroad yard in the world. Here is the tower, standing eight stories over Bailey Yard. We paid our admission fees and took the elevator up to the top. The 7th floor is an open-air viewing platform facing the yard, while the 8th floor is enclosed but looks in all directions. 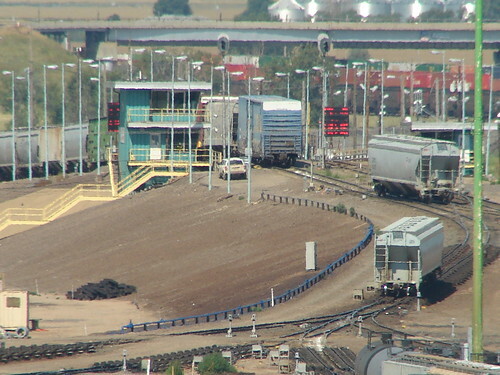 To the west is the locomotive maintenance shop (at left), the servicing tracks including the tall white sanding tower (used to refill the sand boxes; locomotives drop sand on the tracks to improve traction) in the center, and the eastbound hump classification yard, where trains are broken apart a few cars at a time and allowed to roll into the tracks in the yard to reach the train that will be sent out to the cars' ultimate destination. 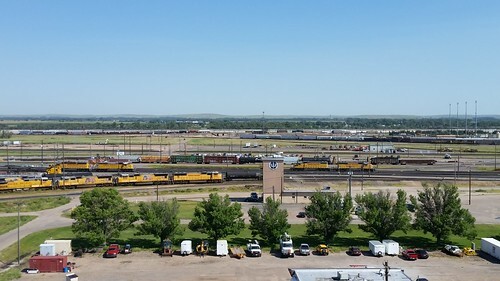 Directly in front of the tower looking north is the east yard office and the westbound hump classification tower in the distance. 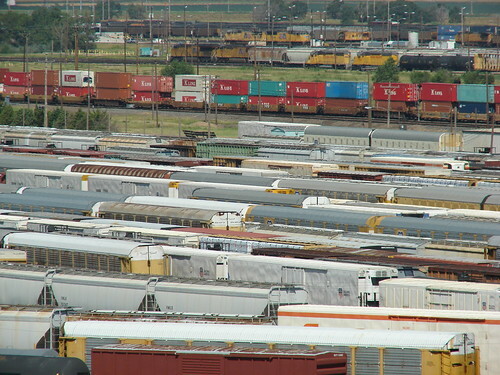 Locomotives stored near the maintenance shop trail off to the left. 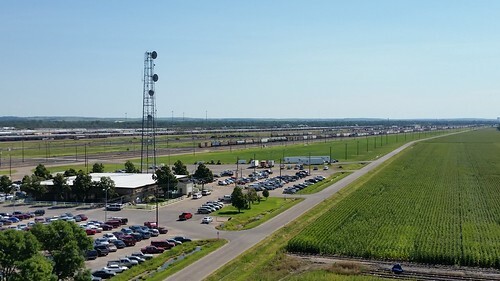 To the east is the overall Bailey Yard headquarters and more of the westbound classification tracks. Bailey Yard stretches for literally miles. Even from the eight-story-high tower, you can't see the entire length of the yard. 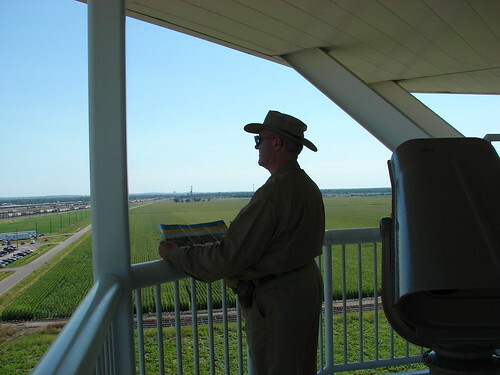 Lisa took this photo of me looking across the yard holding the pamphlet that describes what you can see from the tower. My little camera-phone has nowhere near enough zoom to get this close. Lisa used the telephoto lens on the Sony to take this picture of cars being pushed over one of the two eastbound humps and rolling into the classification yard. Switches work automatically as "retarders" slow the cars so that they do not roll too fast but instead couple at not more than 4 mph to the rest of the cars on their designated track below. 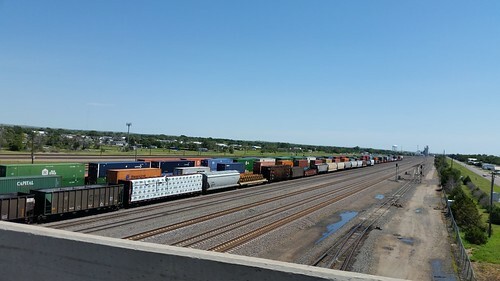 Looking out over the eastbound classification yard, you can see an eastbound intermodal train (which doesn't need to be switched, as all of its cars are going to a single destination) on the "run through" track. All trains stop at Bailey Yard for a crew change. The zoom on Lisa's camera is really good. This is a small yard switcher on the ready tracks near the locomotive maintenance shop. Note that the locomotive's reporting marks start with "UPY" rather than UP. 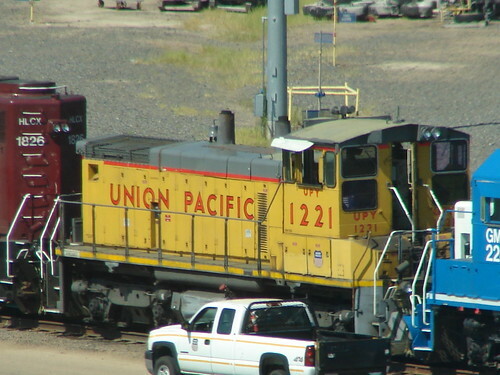 Union Pacific has so many locomotives that the usual US/Canadian practice of using only four-digit locomotive numbers doesn't work, so UP has several other sets of marks, including UPP and UPY. Upstairs on the top floor, you can look to the south, where you see that the yard is surrounded by farm fields. In our opinion, this is for the best. Cornfields don't complain about locomotives switching cars around the clock. Here's a closer view of the locomotive servicing tracks, where engines are fueled and prepared for service. We could have stayed there for many hours, but restricted ourselves to only two, chatting with a former UP signal maintainer who now volunteers with the tower, talking trains to other visitors (I explained to a nice Mennonite couple that the popping sounds they could hear were the air compressors on the many locomotives below popping off), and generally enjoying the view. However, we had other things to see, so we tore ourselves away from the tower and headed onward. 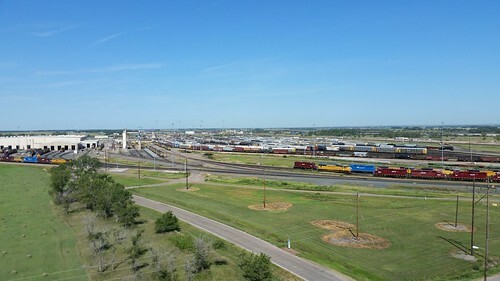 We did take the route to the overpass that crosses the yard, giving us a chance to look at the part of the yard to the east not visible from the tower. After the Golden Spike Tower, we went to Cody Park, where there is a small but impressive train display. 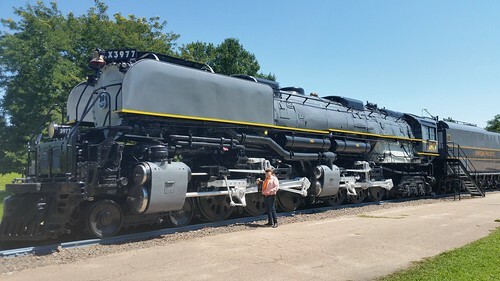 On display here is Union Pacific 3977, a "Challenger" (4-6-6-4 wheel arrangement) locomotive, and only one of two remaining of its type. 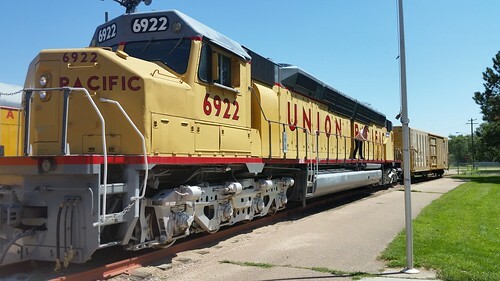 The other, UP 3985, is still owned by Union Pacific and is part of their steam fleet, but is currently offline indefinitely awaiting rebuilding, with two other steam locomotives with higher priorities. Although smaller than the "Big Boy," the Challenger is still huge. Look at how it dwarfs Lisa and travelswithkuma. 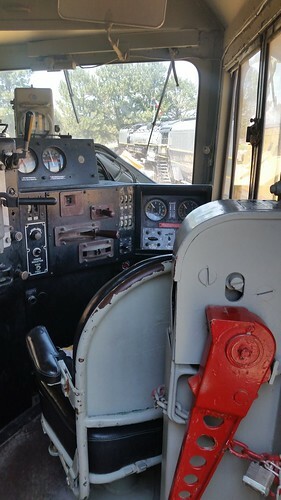 You can climb into the cab of 3977, where you are faced with this daunting set of controls. Built as a coal-burner, 3977 was later converted to burn oil. No matter the fuel, it must have been a challenge (ahem) to fire. 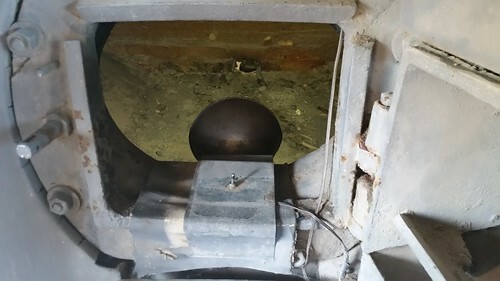 This is the view into the enormous firebox. 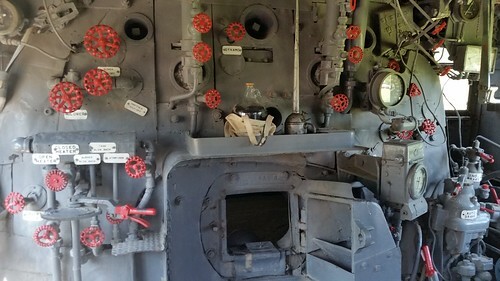 The cab of the locomotive must have been like an oven even in the coldest weather, and it hardly bears imagining what it was like on a muggy summer day like today. 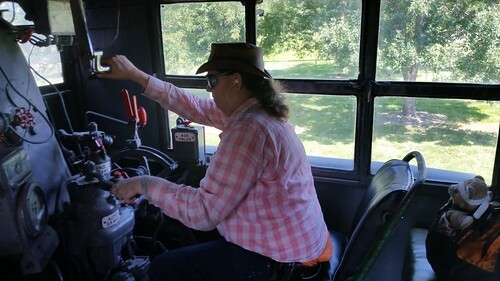 With Kuma Bear perched on the jump seat behind her, Lisa took a turn at the controls of 3977. From the driving seat, this is what the engineer of this locomotive could see looking down the barrel of this enormous engine. This is why a common view of steam locomotive engineers is with them wearing goggles and with their heads stuck out the window. It wasn't to feel the wind rushing through their hair — it was because they often couldn't see where they were going otherwise! Coupled behind the Challenger is a set of ex-UP equipment. 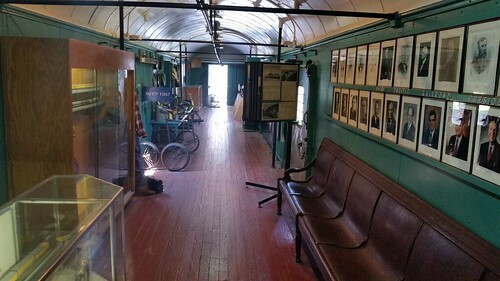 This baggage car contains historical displays. 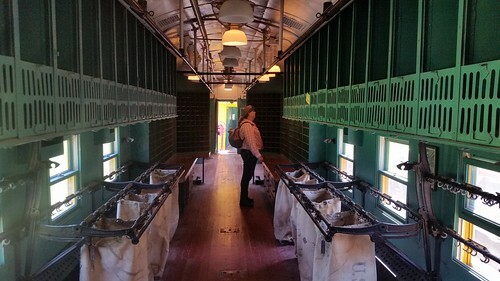 Between the baggage car and the caboose is a Railway Post Office car, where US Postal Service clerks sorted mail as the train rolled down the tracks at speed. There even was a slot in the side of the train where (when the train was stopped, of course) you could drop a letter in like at any mailbox or post office. Also on display is DD40AX "Centennial" locomotive 6922. The DD refers to the fact that it has two four-axle trucks. This is two separate 3,300 horsepower locomotive engines on a single frame. Lisa is standing on the catwalk outside the gap between the two engines. Like the Challenger, it is a huge locomotive. 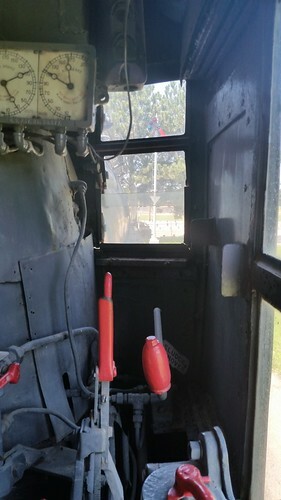 It may not be obvious, but the forward view from the cab of UP 6922 is significantly better than from its steam predecessor. But it's still a big engine. 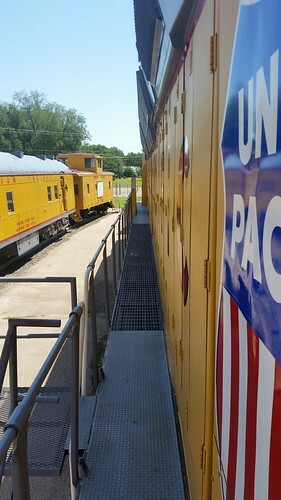 This is the view back along the walkway on the right side of the locomotive. We left a $5 donation with the volunteer staffing the small station within the park. I wish we could have stayed longer, but while we had deliberately cut back our trip legs to do things like this, we still had a couple hundred miles to travel today. 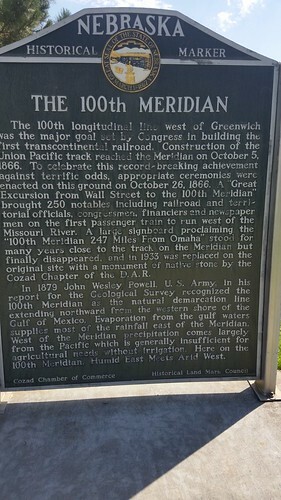 Had we realized how interesting the rail-related things here in North Platte would be, we might have considered trying to stay two nights, spending an entire day doing local tourism, and pushing all the way to Kansas City tomorrow. We refueled at the Flying J on the east end of town, then set out east on Interstate 80. We considered travel plan changes. 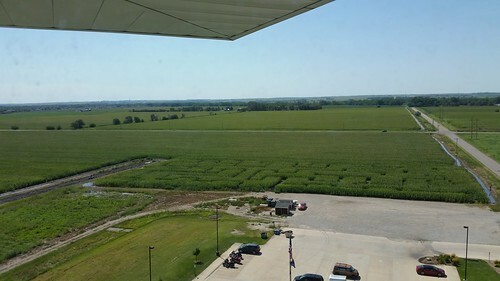 Initially, we changed our hotel booking from York NE to south Lincoln NE, in order to put us closer to Kansas City for tomorrow; however, after a while, we thought better of it and changed the reservation back to York. This still worked out for the best, because in the meantime, the hotel room cost at York had gone down by $20/night! I-80 in Nebraska is no bargain. Lisa got fed up with dodging big rigs and crazy drivers and bailed off for US-30 at Gothenburg. 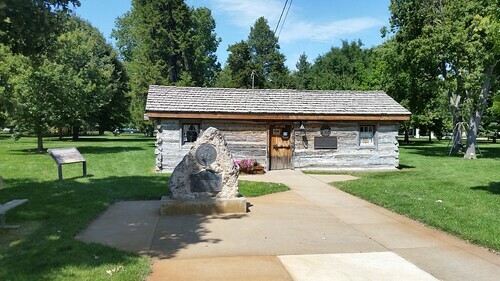 The route into town from the freeway led us close to a park where we stopped briefly to photograph this Pony Express Route cabin. It's not the original location, but it's the original cabin, relocated from a few miles south of here. 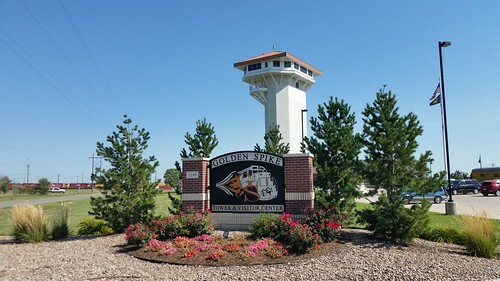 While I'm moderately used to Pony Express trail stuff in the parts of Nevada and California in which I've lived, it's sometimes hard to remember that the trail led clear back to St. Joseph, Missouri. Driving US-30 is slower than the interstate, but more interesting. 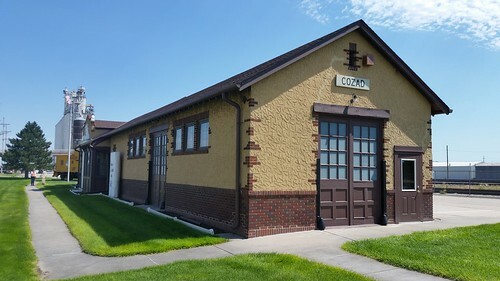 This is the depot at Cozad. 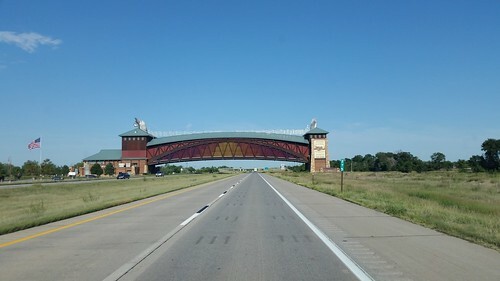 At Kearney, we stopped for dinner, and as much as we would have liked to continue east on US-30, we agreed that we really needed to put some distance behind us if we were going to get any sleep tonight, so we hopped onto I-80 in time to pass under The Great Platte River Road Archway. Just after 7 PM, we pulled in to the Holiday Inn Express at York. While unpacking the car, Lisa discovered that the charger cable that recharges the batteries on her radio had broken. This is not good. Lisa uses her radios to generate static to mask the severe tinnitus in her left ear. (This is why she usually is seen with an earplug in one ear.) She carries multiple batteries, and one of them had already broken. Fortunately, Lisa had come prepared. Lisa carries a portable soldering iron with her heavy traveling kit. For a wonder, it still had some butane in it, so we did not have to set out and try and find a butane refill. (But we'd better get one before the next trip.) However, she didn't pack safety glasses, and working on those tiny wires is difficult. 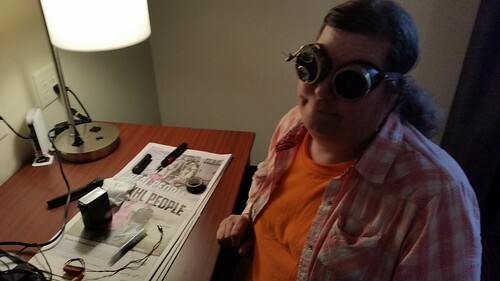 So she got her "steampunk goggles." 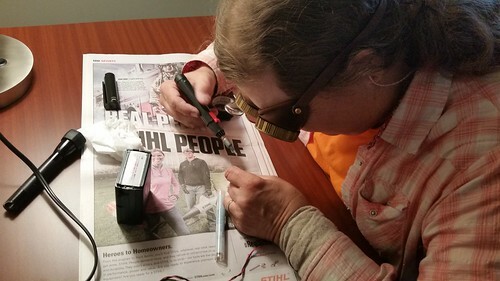 These also work as safety googles, and the little flip-down oculars really do magnify the working area so that she could see what she was doing. With a little bit of work, she got the connector soldered back together, and all was well. We did, however, along the way today buy a large supply of AA batteries. If all of the other backup plans fail, Lisa's radios can be powered by AA batteries. It's expensive and inefficient, but Lisa has to have that masking noise in her ear or she'll go mad. After dealing with the repairs, it was time for the mundane: we needed to do laundry now so that we don't have to do so during Worldcon. Although apparently there is a guest laundry facility at the Holiday Inn Aladdin in Kansas City, we really do not want to spend any part of Worldcon hanging around a coin laundry. There are much better ways of spending our time there. Tomorrow we put aside the tourism and head to Kansas City. Many of our friends are already there working on the set-up. We hope to get into KC in the mid-afternoon, not too early to check in to our hotel and not too late to pick up our credentials and possibly help with set-up in some way.